What's Cooking At " Get Fresh"
Kelley and Caroll, our favorite new neighbors on The Block, emailed their very attractive newsletter for me to include in Zuzu's Blog. Forgive me for not being able to transfer their pretty pictures and logo along with the text . Anyway,we're thinkin' there is some kind of pretty sumptuous romantic Valentine's Day combination that one could put together with The Get Fresh 3 Course Menu and an armload...or handful... of Zuzu's Flowers. How much more cozy and intimate than yet another dinner out. In the month of February, when you buy anything at Get Fresh, you get a free one-day pass to New York Sports Club on 9th Street! Existing NYSC members get $5 off their order of $50 or more. Simply show us your membership card-it's that easy to Get Fresh and Get Fit! We have lots of exciting things happening in February at Get Fresh, including a cooking class with Peter Berley, cooking and nutrition classes for kids and adults with Laura Fischer-Harbage, and Get Fresh First Tuesdays at the movies featuring Sustainable Table and The Meatrix! We look forward to seeing you at Get Fresh, your locally owned, locally focused, and locally delicious source of real meals ready to cook! SURPRISE YOUR SWEETIE ON VALENTINE'S DAY! Bittersweet chocolate and caramel terrine, or Fudgy brownies with Ronnybrook Vanilla ice cream3 course dinner for 2 $70Available February 14, 15 and 16. Order by February 8th.Free delivery in Park Slope, Carroll Gardens and Cobble Hill$30 delivery to Manhattan. Call 718-360-8469 to place your order, or click here for more info. COOKING CLASS WITH PETER BERLEY! Author of The Flexitarian Table and Fresh Food Fast, and instructor at The Natural Gourmet Institute, Peter Berley will teach us how to create inspired, flexible meals for vegetarians, meat lovers and everyone in between! February 24 from 1pm - 3pmCost: $40RSVP: Prepayment required by February 17. Call 718-360-8469 to reserve your spot. It's just a fact-kids love to get in elbows deep and cook! And even better, they love to try the things they make. So why not start your child down a path of excellent food choices the fun way-with Delectables for Ducklings. From baked goods to full meals, at these classes you and your child will learn to make a variety of delicious, healthy foods. Parents will learn tips to get their kids to eating better and everyone will learn about great nutrition and easy ways to get it. While the oven bakes our masterpieces we will do a small edible project. After it's all cooked, we will taste together and of course send you home with whatever you don't finish. Parents and kids alike will learn a lot-and have an absolutely ducky time doing it! Classes are taught by Laura Fischer-Harbage, Certified Holistic Nutritional Counselor who specializes in family nutrition. Come find out what everyone is quacking about! This class is designed to help you plan meals and prepare meals for the whole family. Whether your baby is now ready to move on from basic purees to more complex foods, or you have a child for whom you have been cooking "special toddler meals", this class will help you unify your meals at home so that all can eat "table foods" together! We will cover your child's nutritional needs and how to meet them, as well as tips to address fussy eaters before it becomes a problem. Suggestions are quick and easy with the objective of making one meal to accomodate the entire family. This is the first step to phase out child vs. grown-up meals. We will also discuss how to transform your routine cooking to simple yet extraordinary, healthful meals. February 9 from 1-2:30 pmCost: $25 RSVP: Prepayment required by February 6. Call 718-360-8469 to reserve your spot. If you are one of the many parents who stresses about what your children eat-or more likely won't eat-this class is for you! 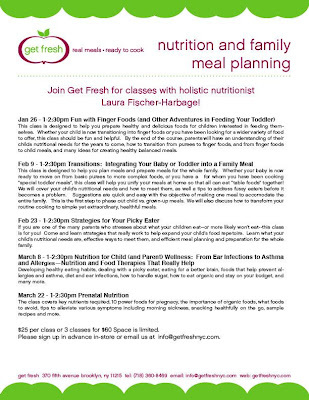 Come and learn strategies that really work to help expand your child's food repertoire. Learn what your child's nutritional needs are, effective ways to meet them, and efficient meal planning and preparation for the whole family.February 23 from 1-2:30 pmCost: $25 RSVP: Prepayment required by February 20. Call 718-360-8469 to reserve your spot. More information on all these events can be found on our website at http://rs6.net/tn.jsp?t=yhiw4icab.0.nvleajcab.m5rujfcab.0&ts=S0311&p=http%3A%2F%2Fwww.getfreshnyc.com%2Fspecial_events.php. See you soon! 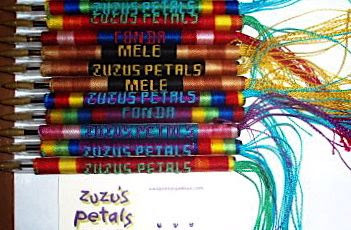 We are going to put our order in for Zuzu's Happy Pens. an ordinary pen into an instrument of joy. $40 by the dozen, assorted colors, up to 12 characters. These are a few of our newest Valentine's Day Greeting Cards. own expressions of affection and devotion. And back by popular demand, our red glass hearts. 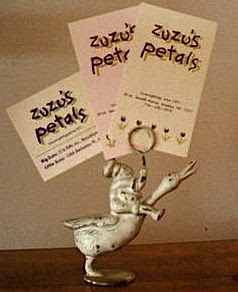 we now offer:" Zuzu To Go". Lavender or Lime take-out food box. Order ahead and we'll have it ready for pick-up. Starting around $25.00 and up depending on the ingredients. We are so happy with our newest neighbor"Get Fresh" . block into a big, open, attractive, retail space. feeding their kids good food that is good for them. Oh! Bless us all! : The Picky Eater. $25 per class or 3 classes for $60. Tell them Zuzu sent you. These vintage style vases are a warm Blush Pink. archway spanning one side of a glass house to the other. when they have their Orchid Show. That's when I saw it first . or a Chevy with big fins from the 50's. it makes me believe in God. This is one of my favorite things we sell. cut from metal, painted on wood, etched in stone. Too warm and fuzzy even for me. It's a little iron holder...place cards, photos, recipes. Lorraine called it "Cook on a Duck." One day last Spring, I was coming out of Leaf and Bean. I had decided that it was time I got over never walking past the old Zuzus. Almost 3 years since the fire. The Rainbow in need of fresh paint it will never get. So, I went to visit our old friends at the L.N'B. and bought a bag of my favorite coffee. It was the little"Cook on a Duck" halfway in and halfway out. I reached in and pulled it free. making his way towards that crack of daylight. youngest daughter in a spelling bee. A very, very long time ago, when just a "Baby Florist"
I was scornful of the Rose, The Gladiola, Mum and Carnation. Not for me the common, boring, typical Refrigerator Flower. Give me Delphinium, Freesia, Anemones, and Hydrangea. Tulips, Narcissus, Lilac and Peonies. I have grown to appreciate them all...and adore most. Valentine's Day comes out on a Thursday this year. For Zuzu's that's usually a good thing. Yes, the day of the week makes a difference. Valentine's Day is like the Oasis in the Desert of Winter. Okay, not a great literary analogy, but accurate. through till it begins to feel like Spring. We do better when The Day falls closer to the weekend. 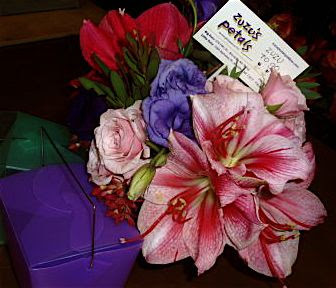 indulge their loved ones in floral indications of affection. Valentine's Day ...I love it and I hate it. So, I hate when I get an Orchid without a tag. but it isn't always easy to get it right. arching gracefully over the foliage in several directions. it will emit a fragrance to attract its polinator. around 9 A.M. in my high North window. Kitty's version of "Cat in a Hat"
I think this little gem is called "Howarea". This is one of my Best Performing Orchids. she was on the road and unable to care for it. James Taylor and Carly Simon's son. stalk for one and a half years. I'd give it a Grammy. It is surely Winter today. I am sitting in my kitchen looking out at my garden. My 40 year old Pine Trees are whipping around in the wind. 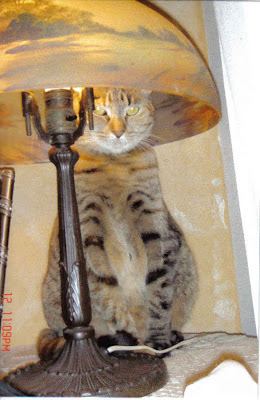 like a misbehaving puppy caught in the act. offer no hint of their lush summer flowers and foliage. The lawn and flowerbeds are frozen rock solid. its rays reaching the far wall of every room. There to greet and absorb the light are my houseplants. For this Gardener, The Indoor Plant is a Friend Indeed. putting my garden to bed for the winter? take in the winter sun. and brings me a bit of the growing season I love.